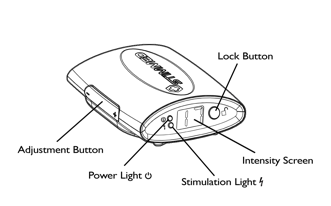 There are two buttons provided on the StimSox™ Stimulator: 1) Lock button, which is the power activation/deactivation button and 2) The Adjustment button. The control buttons are depicted in Figure 1. The Adjustment button controls the intensity of the stimulation. As the adjustments are made, the intensities are visible on the display screen. Follow your medical practitioner’s instructions on where to place the electrodes. Do NOT Turn the Stimulator on until the electrodes are properly in place. It is expected that the operator will be next to the patient’s ankle during equipment setup. The patient should be sitting or lying down while the stimulation is being applied. Step 1: Remove one round and one oval electrode from the package. Step 3: Place the oval electrode on the oval surface and the round electrode on the round surface as shown in the diagram. For maximum patient comfort, the electrodes are intended to be replaced and disposed of after 24 hours of use. Step 1: After applying the electrodes, step on the StimSox™ Boot or place the Boot on the patient’s foot. Place the instep electrode on first, then the heel electrode. Step 2: Wrap the StimSox™ Boot around the patient’s foot and Velcro in place. Step 3: Attach the StimSox™ Stimulator to the StimSox™ Boot using the three snap fittings. Step 4: Wrap the top of the StimSox™ Boot around the ankle.